April 18, 2018. 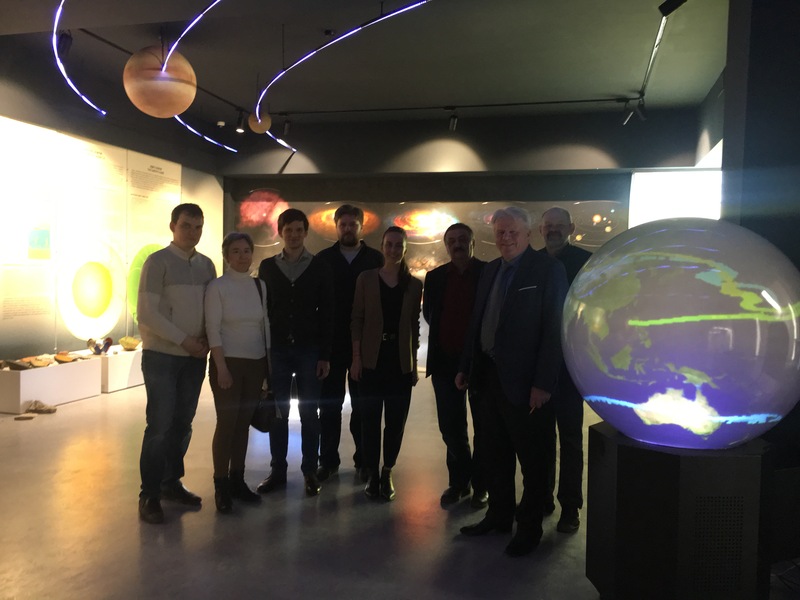 From April 16 to 18, 2018, researchers of the Geophysical Center of the Russian Academy of Sciences, Deputy Director for Development Alena Igorevna Rybkina and programmer of the Innovation Projects Laboratory Sergey Vladimirovich Presnyakov visited Novosibirsk State University (NSU) to develop demonstration content and a programming interface for a new exposition of the Earth's history at the Geological-Geophysical Faculty of NSU. The official opening of the exposition is planned for September 2018. Researchers of GC RAS will develop a specialized educational demonstration content and software interface for the touch screen on the basis of a unique demonstration complex with a spherical screen. This will be the first such complex with training material installed in the Russian Federation. The equipment operates on the basis of Orbus software, developed in GC RAS, and has no equivalent in the world. In the photo from left to right: Dmitry Medennykh (Deputy Dean of GGF NSU), Nadezhda Glushkova, Sergey Presnyakov (programmer of the Innovation Projects Laboratory of GC RAS), Nikolai Matushkin (Deputy Dean for Scientific and Organizational Work of GGF NSU), Alena Rybkina (Deputy Director for Development of GC RAS), Ivan Zolnikov (Head of the Laboratory of IGM SB RAS), Valery Vernikovsky (Rector of the State Oil Company of the Novosibirsk State University), Alexander Dobryetsov (IGM SB RAS).